Caroline realising Chrissie went for a job interview and the hotel thinking that it was Caroline. Paul telling Melanie she will be fired if she doesn't tell him everything. Madge, Harold and Eddie return from door to door campaigning, they are very tired. Sharon comes out of her room to join them. Madge tells them all about the silly questions she got asked. Sharon asks about the speech in the Shopping Centre tomorrow, Madge doesn't know what to say or wear. Everyone gives different advice! Lochie, Toby and Natasha are together, the two girls are arguing over Toby, trying to get his attention. In the kitchen, Joe and Kerry give each other a knowing look as they can over hear the conversation. The girls start arguing more and Joe says they should go outside, the girls don't want to but when Toby says they should both girls follow him! Joe and Kerry are still worried about Toby; he is wetting the bed and won't talk about Noleen. Kerry says it's going to take a while before he is back to normal. Chrissie is on the phone to Melanie, she hangs up as Paul and Caroline return. They are angry that Chrissie pretended to be Caroline, Paul says she has muddied the name of Lassiters. Caroline says Chrissie couldn't do the job anyway, Chrissie says she wanted to prove her wrong. Caroline says that Chrissie never sees interested in a career, Chrissie says she wants to prove that she's as good as Caroline who says she has nothing to prove. Madge is practicing her speech with Sharon, Kerry and Eddie. Harold goes to the printers for some leaflets. Kerry and Eddie are folding flyers. Madge talks about the people that were backing a rival of Harold's to help the proposed shopping development. 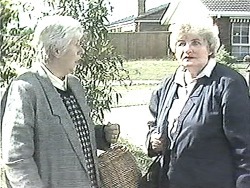 Kerry and Sharon think Madge should speak up and report them, Madge isn't as sure as she thinks it will just be sinking to their level and she doesn't want Harold to get dragged into it. 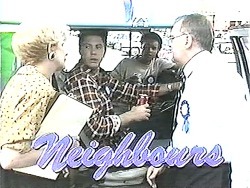 Eddie is trying to hold of Joe's van for the campaign; Joe says he can't as he needs it for work. Eddie says Madge will give him loads of Council work if he helps, Joe then changes his mind. Caroline feels guilty about Chrissie; Paul wants to fire Chrissie and Melanie. Caroline tries to persuade him not to, Caroline says she will sort everything out; Paul reluctantly agrees and goes to see Helen. Caroline apologises for making Chrissie feel inferior. Chrissie says that Caroline is better than her at everything. Caroline says she is more creative and should try using that to better herself, Chrissie wants to be a business success though, Caroline says she will help her but she needs to apologise to Paul. 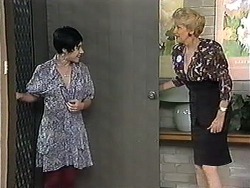 Kerry comes over to tell Madge she can't go to her speech because she has to look after the children. Madge still doesn't know what to wear, Kerry tells her Joe is helping out; Eddie has planned everything militarily apparently. 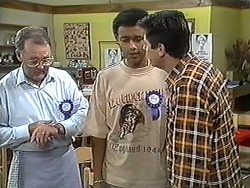 Joe, Eddie and Harold synchronise their watches! Joe and Eddie then mess about, Harold isn't impressed. Sharon comes in and asks if Madge will win, Harold's not sure and says she will be the underdog, Sharon says Harold can help. Lochie and Natasha are still arguing as they leave. Toby has had a letter about a Mother's Club at school; he is a bit upset about this. Madge knocks on the door wearing something very very conservative, Kerry says she should dress more like herself and not like The Iron Lady! (Margaret Thatcher). Chrissie comes in and offers her resignation, Caroline wants to know what is going on as Chrissie leaves. Paul says he's going to accept it but Caroline says she knows Chrissie doesn't really want to leave, Paul is bullied into helping! Joe's van is decorated with banners and bunting and a loud speaker system. They leave to go and meet Madge but Joe has left the microphone on! As he and Eddie drive a long they are telling jokes, including one about a fat man who is jogging on the pavement (in a woolly jumper), the man looks unimpressed to say the least as he hears what they are saying. More people's attentions are drawn to the van as it drives along. Chrissie is listening to music as Paul comes in and compliments her on the job she's done in the gift shop. He says she shouldn't compare herself unfavourably against her sister, Chrissie says he's just trying to be nice. Paul says she can make a massive success of the shop; everyone likes her including the customers. Chrissie then rips up her resignation letter! Toby comes back in from playing outside and switches on the TV, Kerry asks about school just as Sky starts crying. Toby then starts crying and Kerry goes to hug him. Joe and Eddie are in the van talking about Madge and Harold, the loud speaker is still on. Joe compares Harold to Prince Phillip, saying he can't stay in the background and that Harold will become bored with being in Madge's shadow. 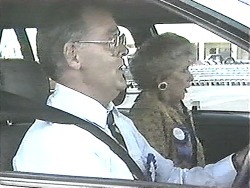 Madge and Harold arrive in their car and realise the loud speaker is on, they race over and open the van door, Joe looks guilty!